Denver Nuggets guard and former N.C. State star Julius Hodge was shot and wounded early Saturday while driving on a highway, authorities said. The team said he is in fair condition and is expected to make a full recovery. Sheriff's deputies said the 22-year-old player was struck in his lower body. "The preliminary reports are that he's going to be fine. 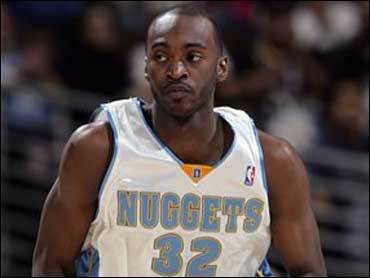 He should be able to play again in two to three weeks," Nuggets coach George Karl said. Hodge's vehicle was hit with several bullets from an unknown type of weapon. Some of the rounds struck Hodge in his lower extremities. After being hit by gunfire, Hodge stopped his vehicle in the middle of the road and the passenger flagged down another motorist, who transported them to the hospital, reports CBS affiliate KCNC-4 in Denver. Hodge was on Interstate 76 in north Denver at about 2 a.m. when another vehicle pulled alongside and someone inside fired several shots, Adams County Sheriff's Sgt. Louis Dixon said. He declined to say how many shots were fired. Dixon said authorities do not know the name of the motorist who stopped. He said investigators hope that motorist and any witnesses would come forward. Dixon said Hodge's passenger has been interviewed and is not a suspect. He declined to release the passenger's name and would not say what kind of vehicle Hodge was driving. The mood was quiet at a Nuggets shootaround before Saturday night's game against Golden State in Denver. "There was a bit of trauma hitting us this morning. We were really solemn, crying," Karl said. "Right now we are just happy that everything is OK."
Nuggets general manager Kiki Vandeweghe said the team had little information on the shooting. "First and foremost, our primary concern is Julius' health," he said. Hodge was Denver's first-round draft choice in 2005 out of North Carolina State. The 6-foot-7 guard was recalled from the NBA's developmental league last month after Earl Boykins broke his hand. He has appeared in 14 games for the Nuggets this season, averaging 0.9 points in 2.4 minutes. © 2006 CBS Interactive Inc. All Rights Reserved. This material may not be published, broadcast, rewritten, or redistributed. The Associated Press contributed to this report.